Visit the new EFCE Forum web page! The call for papers is open! Thank you for joining WCCE10! 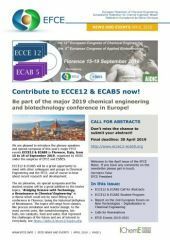 Since 1953 the European Federation of Chemical Engineering has promoted scientific collaboration and supported the work of engineers and scientists in 30 European countries. Moreover, from the very beginning Eastern and Central European countries were included. Today the EFCE represents more than 100,000 chemical engineers in Europe. With its 20 Working Parties and 5 Sections it covers all areas of Chemical Engineering. We invite you to participate in the wide range of EFCE activities. We would especially like to draw your attention to our events and Sections, in which everyone is welcome to participate. Last chance to contribute to ECCE12/ECAB5! The call for applications is open.